Welcome to the land of love, elegance and lightness. Come on in! We think you're nice! We greet you and your family with open arms. Our uncomplicated and cheerful manner is contagious. Enjoy the white beach, the azure sea of the French Riviera and the fabulous, old chateau of our Les Tourelles Holiday Centre. Let your soul run free or go where the action is. Cook for yourself or allow us to pamper you. "Pas de probleme" is the rule here in Southern France. So, what are you waiting for? We look forward to meeting you! Once Les Tourelles, always Les Tourelles! This is because here in France you live like a god. 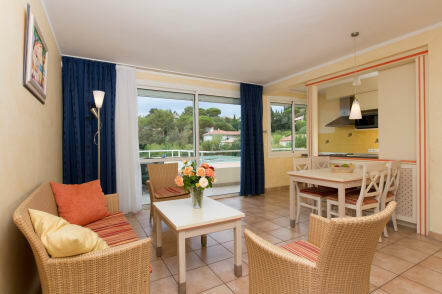 Your holiday let is located directed on the southern coast of France with a view of the bay of Saint Tropez. Whether you're a couple, come with the whole family or with friends there is room for two, four or six people in the smartly and fully appointed holiday let with a balcony or terrace. 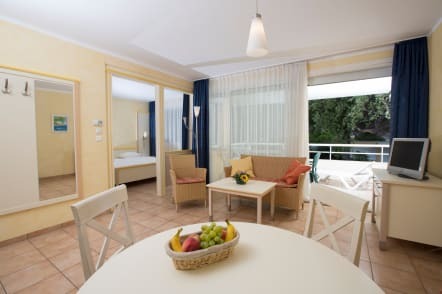 We provide you with linen and towels. Prepare delicious evening meals and breakfast for yourself or enjoy them in our restaurant. It's also possible to spend the winter in our apartments. Everything for a fair price - just as it should be among friends! Aromatic herbs and colourful markets is the culinary side of the South of France. The aromas of Mediterranean meals are just too tempting. Champagne, crêpes or the marvellous freshly baked baguette with lightly salted butter. French cheese, fresh, juicy tomatoes, aubergines, olive from the marché! A must for all hobby cooks and gourmets. Freshly caught fish and mussels can be found in the harbour. Grab yourself a cookbook. You will find practical cooking utensils in your holiday apartment. But of course the numerous bistros and restaurants are happy to pamper you as well - including us here at the holiday centre. Bon appétit, messieurs dames! Enough of the fabulous view of the bay of Saint-Tropez, the wonderful beach and the picturesque village of Sainte-Maxime? For the athletically inclined our football pitch or volleyball court is all the rage at the holiday centre. The kids love our playground, while you celebrate and play boules with friends. A wellness day? Sauna, steam bath and a swim in the pool - with pleasure! Sunset with an evening meal on our large castle terrace? Everything is here and easy to access. Winters as well as summers. The reference label for successful family holidays . We guarantee a special welcome for your children. 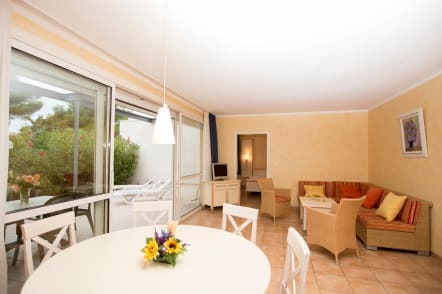 Cot , highchair, booster seat, adapted menus but also sports field , playground , swimming pool with children's pool and water slide will make "les Tourelles" your family destination in Sainte-Maxime ! Ideal for honeymooners, those yearning for something extra or royalty! This exclusive suite is located in the Château and is just for two. The feudal living room with dining area is anything but modest. In your separate kitchen you will certainly cook like a god in France and then dine on the roof terrace above the rooftops of Sainte-Maxime with magnificent views of the sea. A handsome, French apartment for two, 37 m2 with shower, WC and hairdryer, a cosy living room incl. dining nook, well-appointed kitchenette and a balcony or terrace. You sleep in a separate bedroom with a cosy double bed. On request we can also provide a cot for an additional person in the living room (against a surcharge). A handsome, French apartment for two, 37 m2 with shower, WC and hairdryer, a cosy living room incl. dining nook, well-appointed kitchenette and a balcony or terrace. You sleep in a bedroom separated by a partition with a cosy double bed. On request we can also provide a cot for an additional person in the living room(against a surcharge). The magnificent view of the sea tops off this apartment for two. On 37 m2, incl. modern shower, WC and hairdryer, there is a separate living room with dining nook, a well-appointed kitchenette and a south facing balcony or terrace. A separate bedroom (some with partitions) houses a luxurious double bed. 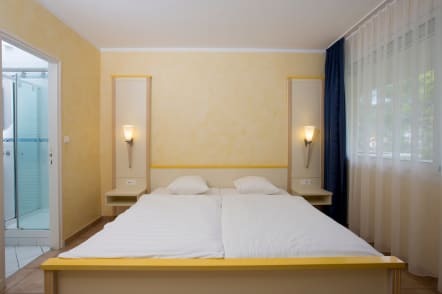 An additional bed (against a surcharge) can be set up in the living room on request. A handsome, French apartment for two, 37 m2 with shower, WC and hairdryer, a cosy living room incl. dining nook, well-appointed kitchenette and a balcony or terrace. You sleep in a bedroom separated by a partition with a cosy double bed. On request we can also provide a cot for an additional person in the living room (against a surcharge). Exactly the right thing for holidays with the whole family! 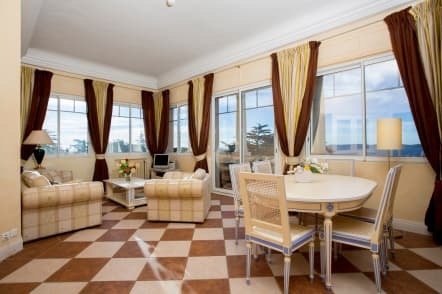 Your cosy apartment for four people with 52 m2 includes two bright bedrooms with a double bed and two single beds, as well as a modern shower with WC and hairdryer. There is space for everyone in the friendly living room with a balcony or terrace, as well as the inviting dining nook and a well-appointed kitchenette. Exactly the right holiday for the whole family! 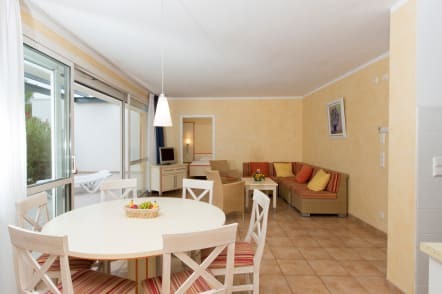 Your cosy apartment for four people with 52 m2 includes two bright bedrooms with a double bed and two single beds, as well as a modern shower with WC and hairdryer. There is space for everyone in the friendly living room with a balcony or terrace, the inviting dining nook and a well-appointed kitchenette. Your large family will find space in our apartment for six people. On around 73 m2 there are two charming bedrooms with two double beds and one bedroom with two single beds. Two modern showers with WC and hairdryer as well as a luxurious living room with a dining nook, a well-appointed kitchenette and terrace permit you a lot of options. On request we are happy to add a bed for you in the living room (against a surcharge). 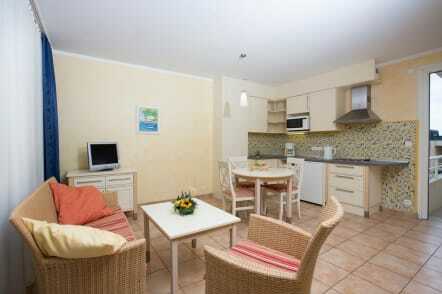 Appartement « Monaco », 6 pers. Your large family will find space in our apartment for six people. 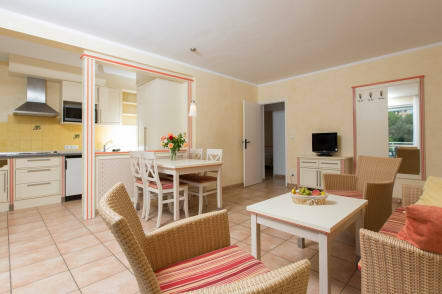 On around 73 m2 there are two charming bedrooms with two double beds and one bedroom with two single beds. Two modern showers with WC and hairdryer as well as a luxurious living room with dining nook, a well-appointed kitchenette and terrace permit you a lot of options. The apartment largely meets the requirements for wheelchair users. It will probably be love at first sight, as it's out of this world here: The choicest spots along France's Mediterranean coast, where the sea is a fantastic blue, the sandy beach whiter and finer, the palms more lush and the orange trees more beautiful than anywhere else in the world. 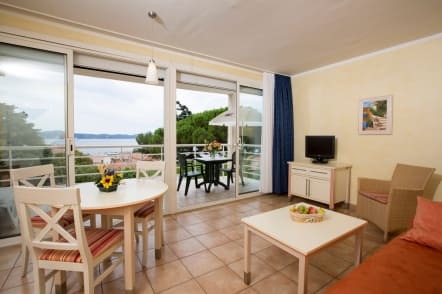 You will have to find out for yourself how it will make you feel: While swimming, diving, taking the sun, dreaming and relaxing in Sainte-Maxime in the holiday apartment of your dreams at Les Tourelles Holiday Centre. The people of Sainte-Maxime are lucky, they are pampered by the sun. The prevailing climate is quite mild, with sun 300 days per year. Beyond the coast, hence in the hinterland, Sainte-Maxime offers wonderful excursion destinations. Whether on foot, on horseback or on a mountain bike, enjoy the typical landscape of the Provence with fields of thyme, oregano, rosemary and of course lavender. Also olive trees and a number of grapevines are endemic there. An excursion into the country is tremendously enriching! Sainte-Maxime is located across from Saint-Tropez. Cannes, Nice and Monaco are close enough to reach out and touch - world famous places, their names synonymous with the sun and Southern French joie de vivre. So you shouldn't miss, for example, a stroll on the "Croisette" in Cannes. Numerous events are held there in the summer - from street theatre to concerts. In May the renowned film festival with heaps of international starts are guaranteed excitement. Nice and Monaco also have a great deal of culture to offer. Countless museums, gardens and parks throughout the Mediterranean municipalities are sure to entertain. 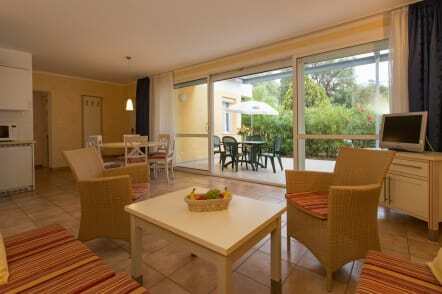 We of the friendly, attentive and uncomplicated holiday centre at the Côte d'Azur invite you as our guest. We are there for you the whole year roun. Naturally we speak your language. Not just your native tongue. Understanding also means ensuring you feel at home with us, as you should travel to be happy.